His long awaited dream project - Jagga Jasoos, finally released last week. While certain sections of the audience and film critics had mixed views, several families, industry veterans, critics and young fans of the actor appreciated the beautiful film and all the hard work that has gone behind creating it. And honestly, we couldn't stop praising the actor enough. After all, only a gifted actor of his calibre could do justice to a character like Jagga, and wholeheartedly believe a film maker's vision, despite the hurdles and hiccups. There is no doubt that he is one of the most fantastic, versatile actors in the Hindi Film industry today. And from here, Ranbir Kapoor is all set and raring to go far, far ahead. Never the one to shy away from experimenting with his characters or looks, RK is currently sporting a muscular, beefed up avatar for his portrayal of Sanjay Dutt on the big screen. With a challenging biopic up for release next year and a dream fantasy project alongside Amitabh Bachchan in his kitty, the talented actor clearly has his hands full. In an exclusive chat, Ranbir Kapoor discusses a variety of things - ranging from upcoming films, being a producer, challenges of working on a biopic and more. Since Jagga Jasoos took a lot of time to develop, as a producer, did the process get a little frustrating? Were you impatient? Yes, there were times when I was frustrated. I even had a word with Dada (Anurag Basu) and asked if we should shelve the film or go ahead. We could have lost all our money if the film got shelved, but we went ahead with his conviction and passion. Jagga Jasoos is a film made for children and it's a family entertainer. We wanted people to go to the theatre and enjoy it. Before the release, when I personally saw the entire film, I was happy and content with the end result. What was the experience of becoming a producer like? Since childhood, I have always been a fan of films. I love entertaining movies. When Dada (Basu) narrated the story, I immediately liked it and thought of producing it with Dada. I was working as a strainer between Dada and Disney, as both of them used to vent out their frustration through me (smiles). The film had a long wait of 3.5 years and then, there were various reports of Katrina and my break up. People even started saying that we have made changes in the film due to that. Honestly, producing a film is very tough. You saw some ups and downs, before hitting the bulls eye with Ae Dil Hai Mushkil last year. What was your thought process like, especially during that tough phase? When your film is doing well, you are actually happy, only until your next film is up for release. I belong to a film family. I have seen failure and success very closely. Failure teaches you a lot. However, I have never suffered any kind of frustration due to it. You have always had a good equation with your co-stars. What was it like with Katrina Kaif, especially during the making and promotions of Jagga Jasoos? I think after my parents, I have learnt the most from Katrina. We have been friends for 10 years now, and I would always want her to be in my life. When we broke up, there were stories that we don't see each other and were not on talking terms. But, this was completely baseless and untrue. Katrina is a wonderful co-star. She is someone who always wants her co-star to shine. She is very focused and hardworking. Also, the fact that a relationship does not work out is never in our hands. Some work out well, some don't. However, with Katrina, I have this incredible partnership which will always stay with me. Your next is a biopic on actor Sanjay Dutt. How has the experience of working on this film been for you so far? This film is definitely not made to glorify Sanjay Dutt. Director Rajkumar Hirani was very sure about this one thing right from the beginning. We will show the good and bad aspects of his life, and then, the audience will get to see how one can emerge as a winner during difficult times as well. When I heard the full narration of Dutt, I was surprised as to how can one go through all this. He dealt with drugs and then, before his first film - Rocky's premiere, his mother passed away. A few years later, his first wife passed away. Later on, he was charged under the arms act. He has seen a lot in his journey so far. It is difficult to share everything about your life with the public. Frankly, I would never ever do that with my life story. 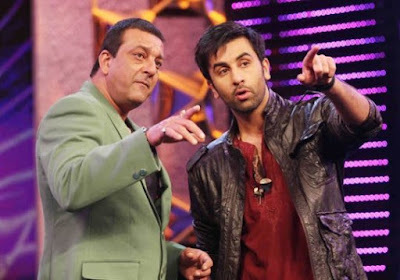 What was it like meeting Sanjay Dutt, especially as the actor bringing his journey to life on the big screen? Actually, I have known him since my childhood. He is a very good human being and always showers his love on me. During some of our previous schedules for the film, there were many times when he was on the set and honestly, I was very embarrassed and nervous. It was an awkward situation for me, where I was acting in front of a legend and he was watching me on the monitor. Later, I told Raju sir (Hirani) that it was embarrassing for me, as even during the take, I used to watch him constantly (smiles). Over the years, you have earned a huge fan following across the globe, especially among the youth. What do you have in store for them next? I am blessed! Right from my debut film Sawaariya to now - Jagga Jasoos, I have got immense love and support from both my fans, the audience and media. Honestly, thats' a huge encouragement for me. So, I have got the Dutt biopic coming up next, for which I am currently shooting. Then, I will working on Ayan Mukerji's tentatively titled film - Dragon, along with Alia Bhatt and Amitabh Bachchan. Ayan has a huge plan for this project, as he wants to make three parts of this film in the next ten years (smiles).